Two bands who have shared a meteoric rise to indie pop fame this year will be together at Lincoln Hall this Thursday, October 16. This is very exciting stuff. Both Surfer Blood and the Drums are known for their revivalist beach pop. Oceanic melodies, hooks that recall the 80s (especially from the Drums) and slacker indie style are all sure to be in attendance. There are two separate shows due to demand - one at 7 p.m. and one at 10 p.m.
Also of interest: the Drums will be playing without guitarist Adam Kessler. Kessler quit the band quite suddenly a month ago, leaving the remaining three members of the band "devastated." 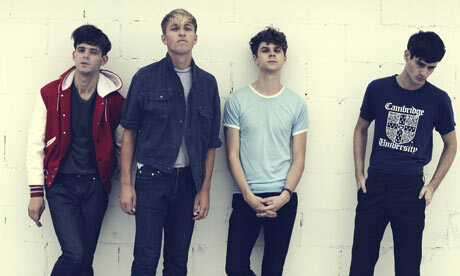 The Drums are continuing their U.S. tour with the help of a replacement guitarist and have yet to definitely state what direction they will go in following the tour. Bands who rise to fame as quickly as these two have to face an extreme amount of pressure, so it will be interesting to see how they are handling it as their first major U.S. tour rolls out. I wish them the best, as they are two exciting new acts with some really excellent songs between them (please insert your own heavy handed riding the wave pun here).